The Rolex Oyster Perpetual Timeless is an unsolicited proposal by Fremdkörper. Unfortunately it is not a project on behalf of Rolex. But it is the „watch“ we would wear. It is the „watch“ witch illustrates impressively the reputation, the quality, the luxury of Rolex. We need to note that we are not sure about the approval by Rolex. Our negation of their key skill runs the risk of being rejected. Generally we consider this concept more as an artwork than a product. The Rolex Oyster Perpetual Timeless is a statement even if it would exist only as a single piece. In Rolex's stead we would present the Rolex Oyster Perpetual Timeless as a limited addition. An if it would emerge as a „product“, the price should be in minimum the same as the watch. As shown in the golden version the Oyster is about 30.000 US$. As from now, the Rolex Oyster Perpetual is timeless. The Rolex is a classic for the wrist. Its history goes back to the year 1905. The first water- and dustproof wristwatch, the model "Oyster" was first presented in 1926. In the early days, Rolex came up with various technical innovations. A Rolex was the first wristwatch that met the criteria of the Official Swiss Rating Centre. The Rolex became synonym for precision. But the increasing success was not only based on the function, it was the acquirement of a good reputation as well. And today, the Rolex is a status symbol much more than in the past. It is worn as a statement. Despite the fact that a Rolex is still performing their original task perfectly—to display the time accurately—today time data including scheduling is better handled by mobile phones. 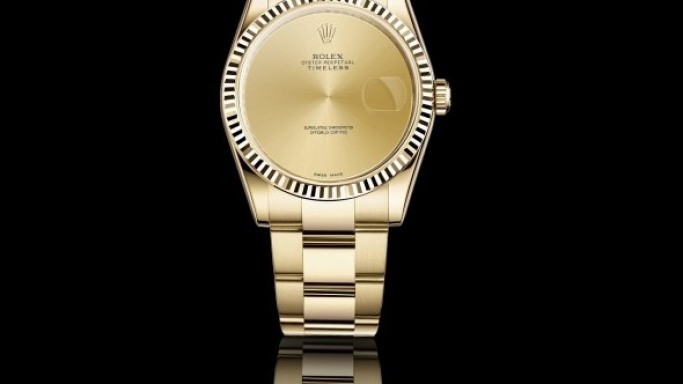 So wearing a Rolex is all about prestige. And it is greatness to abandon the function.